Yes. You read that headline correctly. 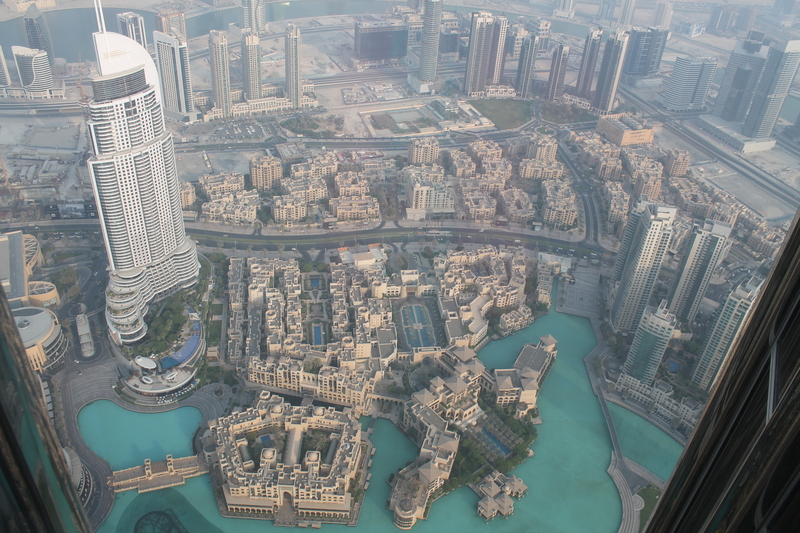 I had high tea at At.mosphere inside the world’s tallest building – the Burj Khalifa. In Dubai. At.mosphere holds the Guinness World Record for highest restaurant in the world from the ground level. 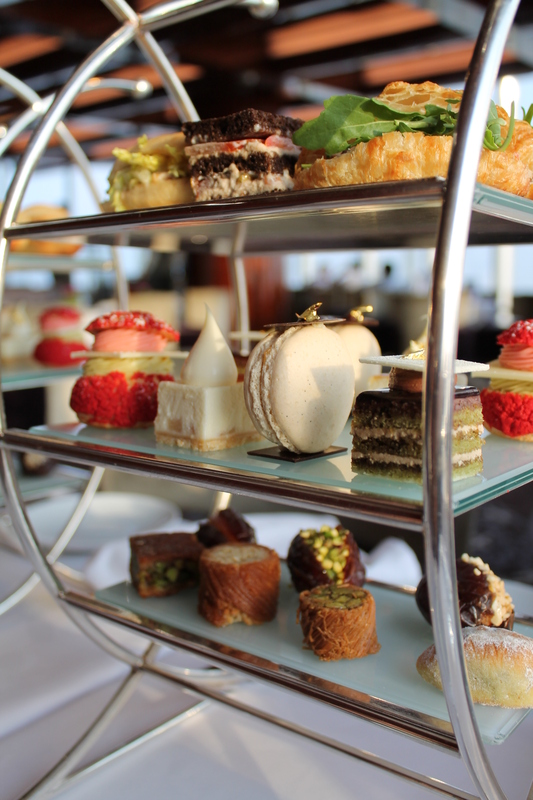 The high tea – quite literally the highest high tea I’ve ever enjoyed – is served in the Lounge and offers views like no other. On arrival you’re served the juiciest stuffed dates. 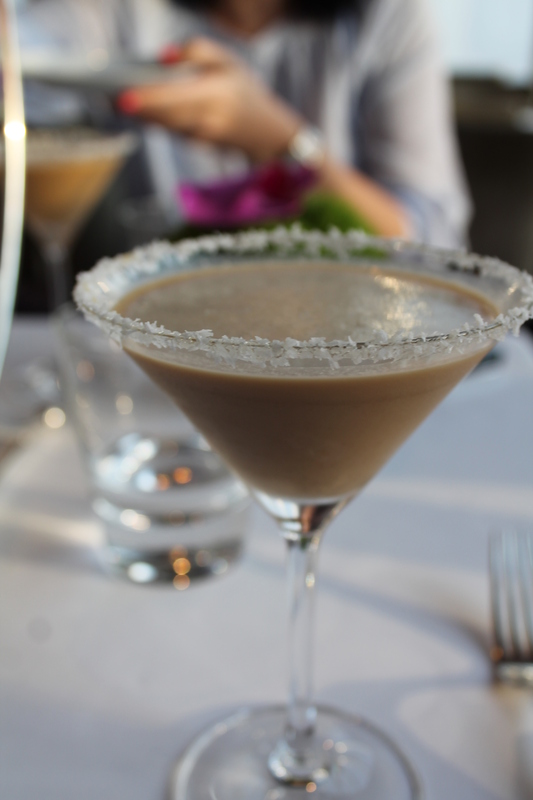 They’re filled with pistachio nuts and macadamia nuts and is just perfection for a date lover. I was taking my first bite into a deliciously relaxing afternoon. A view of Dubai from the Lounge. We sat down on comfortable couches and were served our high tea snacks on a beautiful cake stand. The top level of the three tiered stand contained the savoury elements. 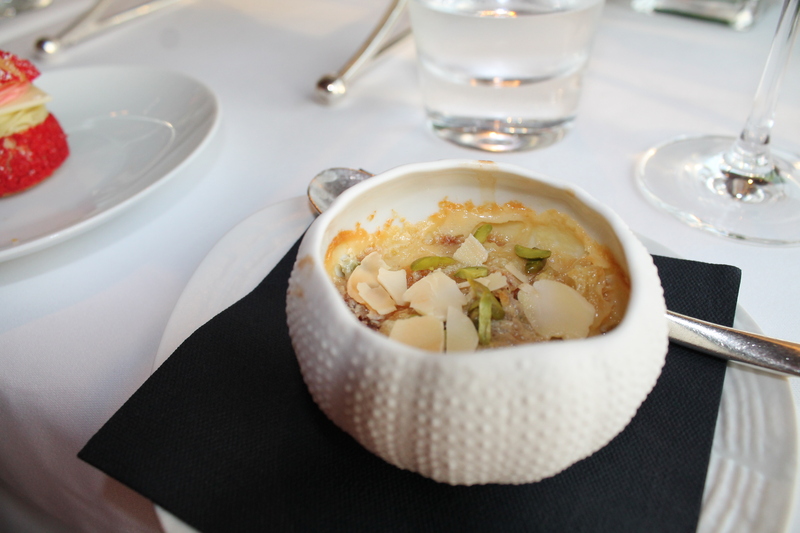 The middle layer had French pastries and the bottom level housed Arabic sweet treats. 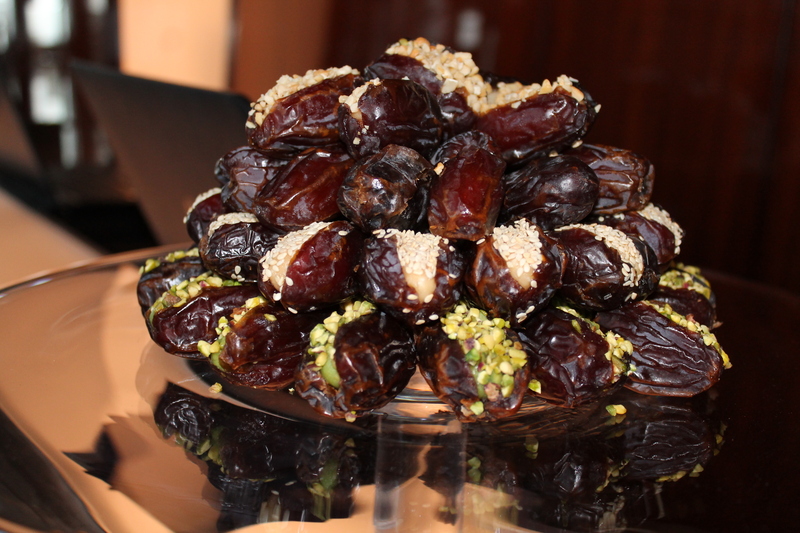 We were also served a traditional Arabic pudding called Umm Ali. It’s layers of pastry and what tasted like a rose creme patisserie and filled with nuts. It’s a delicious warm dessert that I aim to recreate at some point. There were also many drinks to choose from but since it was hot out, we all opted for iced coffee that was easily the most divine iced coffee I’d ever tasted. 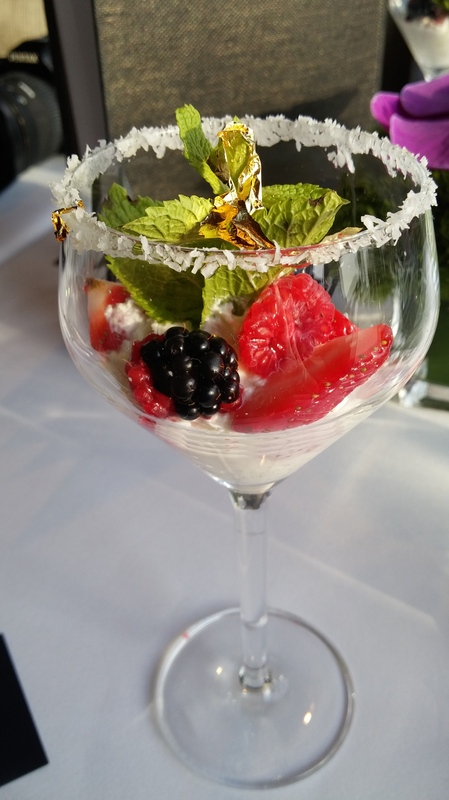 We were also given a beautiful stemmed glass filled with berries and cream topped with gold leaf. There were flavoured scones to choose from – plain, chocolate and date. I went with chocolate scones since I’ve made date and plain ones back home. I’m not quite sure how many calories were consumed that afternoon but it was worth every bite eaten. My only slight criticism would be that more savoury options should be added to the cake stand, but that is just coming from someone who prefers savoury to sweet. If you ever find yourself in Dubai and want to do something extraordinarily fancy, book an afternoon tea at At.mosphere. Not only will you get a breathtaking view of Downtown Dubai, you’ll get to relax and dine in style as afternoon slowly makes its way to evening. Full disclosure: I was there during Ramadaan and while I’m a practising Muslim it was “that time of the month” for me so I was exempt from fasting. One is also exempt from fasting while in a state of travel. I will of course make up (as is required) for it before next Ramadaan. I was hosted by Dubai Tourism on behalf of Traveller24 and included all flights, accommodation and meals. For more about Dubai check out: Visit Dubai Southern Africa. It was! I wish I could do it all over again and I definitely recommend it for anyone who happens to be going to Dubai.